Soft, strong and absorbent. I love the texture and esign. Will buy more! 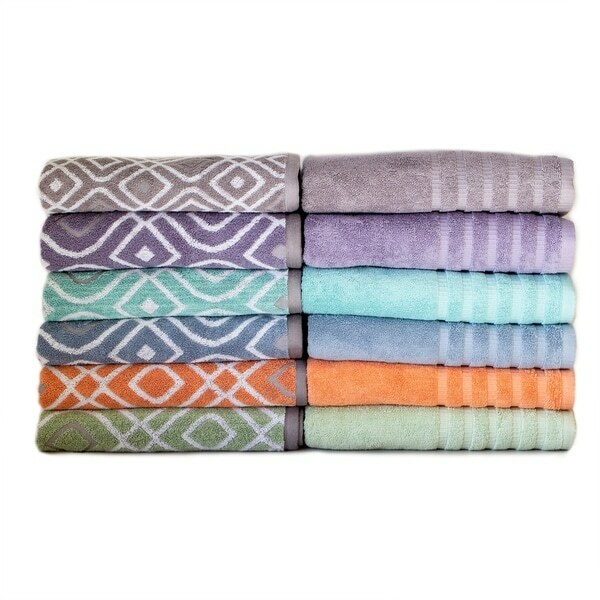 Bring color, style, and elegance to your bathroom decor with this 6-piece towel set. The set features two bath towels, two hand towels, and two wash clothes, crafted from extra soft combed cotton for a cozy, durable, and absorbent design. 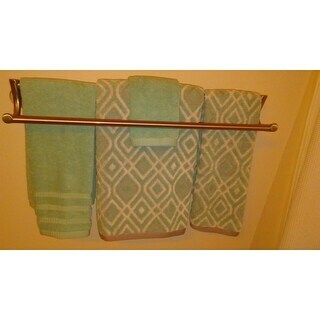 Half of the set features a solid color pattern, while the other half features a diamond graphic design, allowing you to mix and match the towels to add style and texture to your room. I just received today. Seemed a bit thin, but i don't care for tick towels myself. I washed and dried then and they thickened up some. Just right. Very pretty towels and a great price. SECOND UPDATE: DO NOT WASTE YOUR MONEY. UPON WASHING THESE THE SECOND TIME, AT LEAST TWO MORE CAME UNDONE AND BADLY FRAYED. EXTREMELY POOR QUALITY! But they were pretty for two weeks while they lasted. Update: I ordered four sets of these and initially reviewed them after washing the first set for the first time. I subsequently washed the other three sets. The hem on one bath towel came completely unraveled. I noticed tiny flaws in other pieces as well. But overall, i still like them and, except for the one that unraveled, they look good. Lovely towel set. Very soft, and they stay soft after being washed. Color is as pictured. I like that I can mix and match solid and pattern. Highly recommend. These towels are cotton but they had a strange feeling on the surface until I washed them. Pretty colors and nicely absorbent. They are not as heavy as I expected however, all in all a good buy. these towels are so nice, and look expensive. I purchased the coral color and the color is rich. I will use as guest towels in my guest bath. Everything about these towels is middle-of-the-road. They are moderately absorbent, ordinary in size, and so-so on the value. For the price, you can easily find a much higher quality towel at your local bed and bath store. After a single washing, the color faded slightly and the hem facing shrunk causing the towel to become out-of-square. This happened on each of the bath, hand and face towels. Color is as pictured. Towels are a great weight and look great in our master bath. They are very thin and do not look like the photos quality wise. The loops seem sparse compared to the photos.I want to return them but will lose 14.00 for shipping, Not happy with this purchase at all. I just hope they do not fall apart like the other reviews. These are beautiful. I got the lavender and the colors are very true to the pictures. Would definitely order again. No absorbency, pilled terribly and sheds! Purchased coral but it was actually a garish orange! Would not recommend! These towels we're a gift. She loves them in her new bathroom. Soft and fluffy! Happy with the set of towels. Launder up nicely. "I'm hesitant to buy towels because I'm unable to feel for softness and how thick they are. I really like the ones I chose. I guess it's too much to ask. There are no customer reviews to help me. Thank you for your time." This towel set is made from combed cotton, so it will be very soft and comfortable.